As a medium, videogames are inherently ephemeral, meant to be experienced for as long as they hold a player’s attention and then put away. Street Fighter II, originally released in 1991 as the forerunner of the arcade fighting game revolution, bucked the idea of planned obsolescence, and as a result turned itself into a legitimate legend. Despite inviting mockery with constant refinements and balances released as new iterations, the core of Street Fighter II remained an unyielding foundation for players to pick up and mess around with. It would be difficult to find someone who owned a Super Nintendo in the early ‘90s and had not at least attempted to throw a Hadouken. That feeling of nostalgia for an era long past is exactly what Capcom is aiming for with Ultra Street Fighter II: The Final Challengers, a title as descriptive as it is unnecessarily long. Capcom has billed this Switch fighting game as the final iteration for the biggest, and perhaps most-defining, videogame in their history. Presumably, Capcom is also hoping to recapture the success of Super Street Fighter IV on the 3DS, which has quietly and steadily sold well throughout the 3DS’s lifespan. A Street Fighter on Switch was likely a priority, and a wistful grab for wallets in the clothing of Street Fighter II likely seemed the path of least resistance. 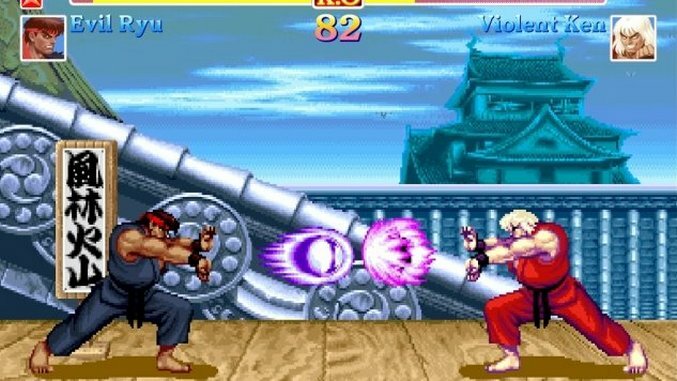 Ultra Street Fighter II can most basically be summarized as a port of 2008’s Super Street Fighter II HD Remix, released on the Xbox 360 and PlayStation 3. All of the game’s sprites were redrawn by art studio UDON, but the animations were left alone, creating a somewhat incongruous dynamic between the fidelity of the characters and their movement. To put it simply, pictures looked better than videos, not allowing perception to march alongside memory with the new HD graphics. This issue dogs the characters all the way to the Switch version. Fortunately, allowing the choice of switching back to the Super Nintendo’s graphics relieves some of the dissonance players familiar with the original will no doubt experience. Ultra Street Fighter II also offers the option to switch back to classic sounds, as well, if the newer remixes and higher-fidelity Sonic Booms end up raising an eyebrow or two. New in this version, and indicated by the Final Challengers part of the title, is the reintroduction of Evil Ryu and canon incorporation of Violent Ken. The new characters—Ryu taken over by his inner-darkness and Ken just taken over by M. Bison—are little more than color changes and dial adjustments to their progenitors. Their existence is not offensive, but after getting billing in the game’s title, it is easy to be disappointed at the lack of weight that should be accompanying them. For the final challengers in the legendary Street Fighter II to be recolors is a little like being told Mario’s final villain is two Toads standing on top of each other covered by a sheet. It is anti-climactic, at best. A final new mode, Way of the Hadou, brings Street Fighter to the realm of the first-person fighter, allowing Switch owners to hold both Joycons and fire Hadoukens at Shadaloo henchmen. It hearkens back to a weird era where publishers felt pressure to justify a videogame’s existence on a Nintendo platform by including themed minigames that never felt commensurately designed with the rest of the game. I cannot imagine anyone picking the game up on the basis of this mode, nor would I ever advise anyone to do so. Its existence is made all the more baffling considering the removal of Street Fighter II’s traditional minigames – if I am being tasked to control Ryu’s arms, why am I not using them in service of destroying a car? Traditional Ultra Street Fighter II on the Switch’s Joycon controllers has unique qualities, but the makeshift D-Pad on the Switch’s left Joycon does not hold up for this type of game. My initial attempts to use it resulted in extreme frustration, bumbling around with Ryu as special move after special move failed to come out. Following reggae fighter Dee Jay’s mocking face taunting me after a battle, I switched my thumb to the analog stick and found it much easier to make my fighter do what I was telling them to do. Experimenting with the Switch Pro Controller proved it to be far easier to use, though it somewhat damages the portability aspect to carry one around alongside the Switch. That portability, however, is also where this game shines. It is difficult to find conditions where a Switch with Ultra Street Fighter II on it is ideal, but I found plenty of conditions that were not, and they were fun regardless. Setting it up on a table and splitting the Joycons between both players, while not exactly a tournament-caliber scenario, was still delightful. I ran into a situation where a Switch dock I did not own was connected to a TV in a shared space, brewing a maelstrom of hooting and hollering from behind as friends passed controllers around an excited room. There is value to the Street Fighter II experience in a portable form, one that feels unyielding regardless of input compromises. No one has ever looked at a finger-sized Joycon and thought “I want to play Street Fighter on this thing,” but a lack of better options helps to do away with most concerns. Street Fighter II is a part of my childhood, so I am more likely than most to approach attempts to advance it with cautious skepticism. For better or worse, Ultra Street Fighter II escapes that skepticism by not doing anything worth being skeptical about it. There are no drastic changes, just smudges at its corners, and the failure of any apparent dramatic variations feels disappointing in its own right. Capcom could very well have tried something different and experimental, and I think that attempt would have had more virtue than simply a good, portable version of an existing game. Ultra Street Fighter II is indeed fun to play, but I can’t help but feel sad to see a legend retire by aiming for the middle. Ultra Street Fighter II: The Final Challengers was developed and published by Capcom. It is available for the Switch.